The pursuit of global sustainability is a thought that’s always on the mind of the employees at Batdorf & Bronson Coffee Roasters. Although their efforts to maintain environmentally friendly business practices are in place year-round, this year’s Earth Day has inspired them to create a new campaign celebrating sustainable practices that everyone can implement into their lives. 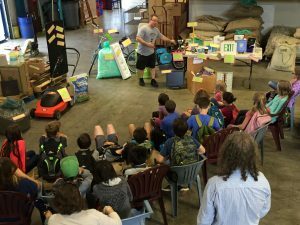 “Historically, Earth Day has been a big celebration at Batdorf & Bronson,” shares Aaron. “What’s new this year is the special campaign and partnership with Habitat for Humanity. Sustainable housing is very much a necessity to promote a friendly and healthy Earth. As a business, we’ve tried to think of constructive ways to help in the effort to create a better place for everyone in Thurston County and beyond.” An all new reusable glass Keep Cup will also be released during the April campaign and be available for purchase at store locations and online. Batdorf & Bronson has also implemented various ways that their customers can get involved in the green initiative. “We always try to encourage customers to bring in their own cup to our stores,” explains Aaron. “With their own cup in hand, no matter the brand and whether it be ceramic, stainless steel or paper, customers will receive 25 cents off of their drink. This is an offer that we extend across all of our stores nationwide.” Another offer that’s extended to customers is to bring in their own bag when buying bulk coffee beans and receive a 25-cent discount on each pound of beans. Founding member in the Environmental Protection Agency’s Green Power Partnership in 2003. 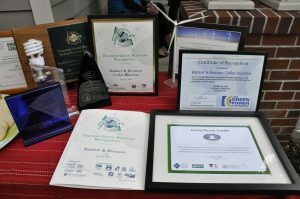 Thurston Green Business Award for medium businesses in 2008. Association of Washington Business in Environmental Excellence for Sustainable Communities in 2014. Rotary Club of Olympia Environmental Protection Award in 2017. 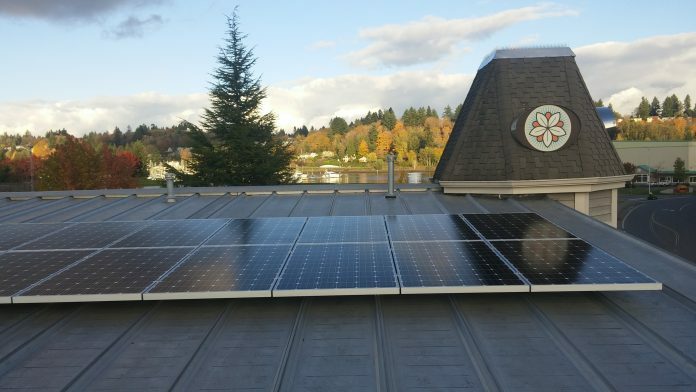 Every aspect of Batdorf & Bronson aims to be more efficient stewards to the environment in order to help protect our planet for both ourselves and our future generations. 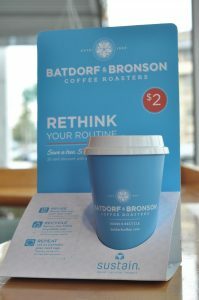 Follow B&B Coffee on Facebook for the latest on limited edition products and upcoming events or visit the Batdorf & Bronson website for more information on these products and locations.